Things are very quiet here, Songkran has begun and many have left Bangkok to celebrate the holiday with their family. Resiliency is the key to overcoming anything in life, that is on display in Bangkok and Thailand. 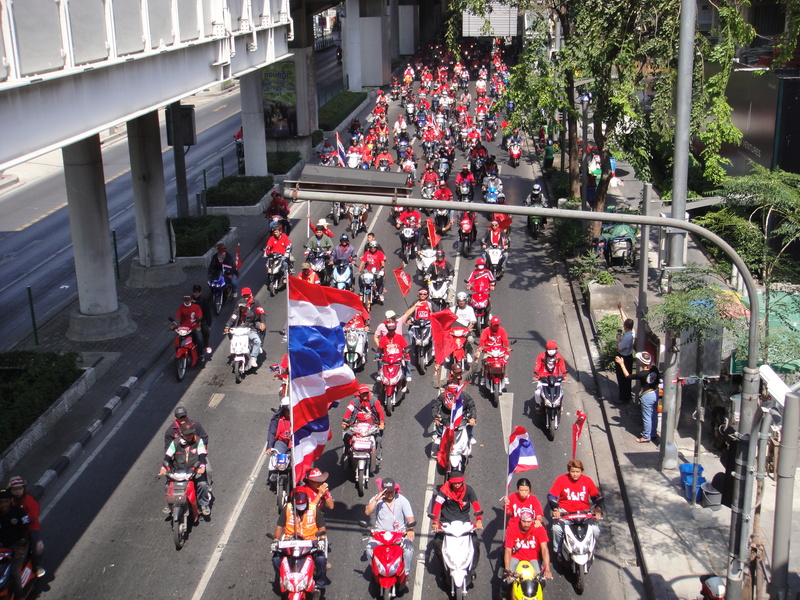 The red shirts had a procession through Bangkok yesterday with coffins of the dead. It was calm, no confrontations. As the day wore on the red shirts continued to parade through the city, more music, horn honking, smiling and flag waving. The red shirts have the momentum, their supports are firmly behind their cause, they will increase their push of the government, they want to justify the deaths that took place and honor those that died. The government is in disarray. The military does not want to confront the red shirts again, the head of the military has come out and said political problems need political solutions. It appears people are very frustrated that numerous deaths occurred, but the situation remains the same- fighting in the streets for no reason. The red shirts and government are not holding talks. 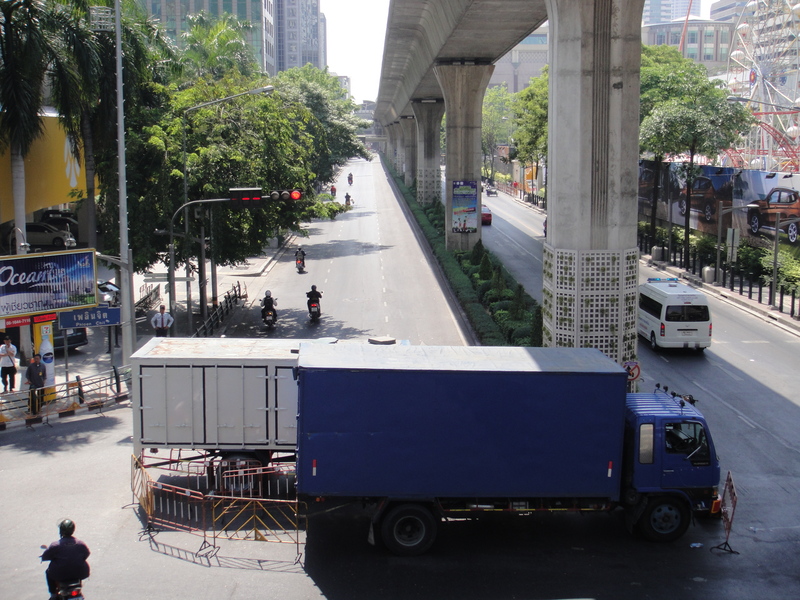 Trucks are being used to block the approaches to the commercial district- it is quiet, but things are not "back to normal"
There are loads of rumors and talk about what happened on Saturday night; there were serious weapons used by both military and red shirts. Some of the military troops had no weapons, some of the red shirts had grenade launchers and there is footage of the military firing live bullets directly into the crowd. How were the red shirts so well prepared and the military not? The government can no longer count on the military, the military doesn’t want anymore Thai on Thai fighting. Saturday night was a failure leading to death, someone has to take the fall. Songkran begins today with all banks and offices closed for the next three days. This is water festival, everyone throws water on each other. Fun- this is New Year in the Thai calendar and one of the most festive holidays of the year. I went to run this morning- big trunk of people came by with buckets of water and squirt guns and soaked me and the traffic officer I was speaking with. I finished my run and was walking back to my apartment, walking the other way was a older Thai lady dressed in the uniform of the gardening staff for the hotel next to my apartment (in Thailand everyone has a uniform, part of helping everyone feel important, treating every job with respect). I had never seen her before, she slowed, broke into a huge grin and said “Happy day everyday, Happy Songkran”. This is the Thailand everyone loves. This entry was posted in Bangkok, Politics, Thailand and tagged Bangkok April, Red Shirts 2010, Red Shirts in Bangkok, Songkran. Bookmark the permalink.